Working with fish is one of Dan’s passions, and it shows! Chinook is pretty darn good on it’s own, but this brings it to the next level. • Place Pan on medium-high heat. Once hot, add 2 tablespoons canola oil, and place the salmon, into the pan, skin-side up. Let cook for 2 minutes on medium-high, and then flip over and cook another 30 seconds on other side. • Prepare braised fennel by cutting 3 small heads of fennel into ½ inch dice, 1 medium onion into ½ inch dice, and the zest of 1 lemon. • Add fennel and onion and lemon zest and cook for approximately five minutes until starting to colour. Add 2 tablespoons butter and ¼ cup white wine, bring to a boil, and then lower heat to medium-low and let simmer until slightly reduced and thickened. Season with salt. • For the Sauce Vierge: Slice 2 tomatoes into ½ inch pieces. Thinly Slice 2 cloves garlic. Finely dice ½ onion. Cut 10 leaves basil into thin strips. • Add tomatoes, garlic, onion and basil into pan and add 3 tablespoon extra virgin olive oil, pinch of chili flakes and pinch of fennel seeds and juice from half a lemon. Put on medium-low heat and cook until tomatoes have slightly broken down, about 5 minutes. 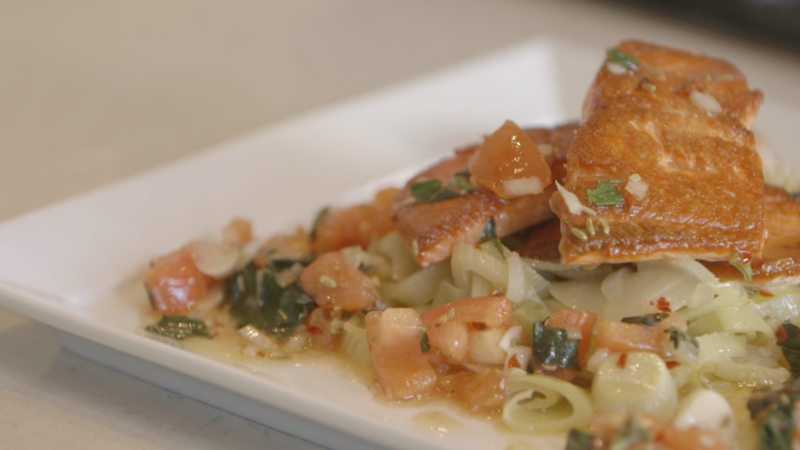 • On the base start with the braised fennel, then add the chinook on top, followed by the sauce vierge.